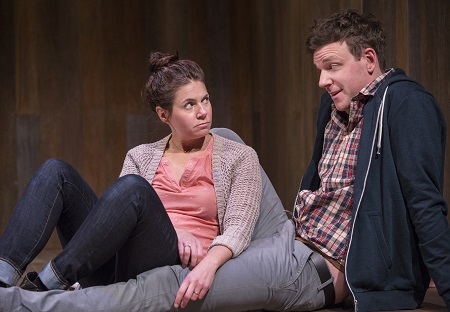 Lungs, currently playing at Tarragon Theatre, is a two-hander that explores the relationship between a man (Brendan Gall) and a woman (Lesley Faulkner) as they decide, and then attempt, to have a child. As the play starts the man has just dropped the “let’s have a baby” bomb on the woman in a most inappropriate circumstance – while in line at IKEA. This provokes the woman into a neurotic spiral, worrying about what a child would mean for their lives, and her body, but mostly concerned with the ethical implications of bringing a CO2-producing human into an overpopulated, over-polluted world. The man tries to calm her down but he does it poorly — as always, telling someone to “calm down” does the exact opposite. That is the dynamic of their relationship: she is anxious to the point of annoyance and he is reticent about his emotions. When he does speak, what comes out of his mouth is usually the wrong thing at the wrong time. For the first part of the play this struck me as unbelievably stereotypical, but talking to my companion for the night afterwards she told me that in her experience people like that, and relationships like that, really do exist. They reminded her of couples – more than one – that she knew in her life. We figured that my reluctance to buy into these characters may have something to do with me living in a “queer bubble” where gender politics just don’t work the same. Even without this insight, I did become emotionally invested in the characters as the play went on. It helps that the show is quite funny, as a good old belly laugh or two never fails to soften me up. And while my own relationships differ from that portrayed in Lungs, I have definitely gone through the “having a baby” experience. A funny thing about procreation is that the various aspects of it either strongly intensifies issues of gender and sexuality, or transcends them altogether. For example, when the woman stated that she didn’t care if the baby had no arms or legs, or was “that thing from Eraserhead“, I knew that they were anticipating the neural tube defect ultrasound, and I understood – I remembered – the stress of that. There are no separate “scenes” to speak of. The two characters stay on the lit stage for the entirety of the show, which portrays the rest of their lives after that moment in IKEA. There is usually not more than a second of pause between a jump forward in time that may cover months or years. It’s remarkable, both for the stamina of the actors and for viscerally manifesting the brevity of a human life. Faulkner was especially impressive, as she has the grand majority of text, including some circuitous monologues. This is a play about regular straight people living regular straight lives, and while I wouldn’t want to be friends with either of the two characters I did care about what happened to them. And the ending itself is beautiful. There’s a certain TV show ending that I could compare it to, but I won’t, because that would be a spoiler. Photo of Lesley Faulkner and Brendan Gall by Cylla von Tiedemann.